We worked with New York-based apothecary brand MALIN+GOETZ on the design of their first two shops in London. 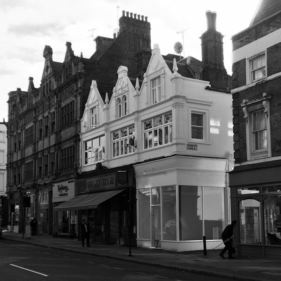 The shop on Upper Street in Islington features an entirely new shop front that shows off the shop’s corner position and re-establishes the height and light present in the original Victorian premises. A contemporary take on a traditional apothecary interior, the shop features a plywood superstructure that combines a coffered ceiling with display shelves and screens that define different spaces within the interior. Reclaimed shop fittings and display cabinets sit on a terrazzo floor and, when the shop is closed, the interior is visible through a veil of 12′ high curtains.